Nickelodeon UK and Ireland's preschool channel, Nick Jr. UK and Ireland, has announced in a Tweet (post) on their official Twitter profile page (@NickJrUK) that Nick Jr. UK and Eire megastar and popular cartoon character "Peppa Pig", who has starred in over 200 five-minute TV episodes, has been voted as one of the greatest children's television shows by staff and readers of the popular British weekly television and radio programme listings magazine, Radio Times! 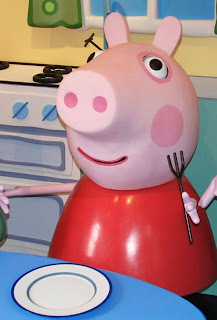 Congratulations, Peppa!! Nick Jr.'s Peppa Pig has been voted as one of the greatest children’s TV show by @RadioTimes. Well done Peppa! - Tuesday 30th July 2013. 8.1m viewers on Nick Jr. year to date can’t be wrong - Peppa Pig is on the Radio Times shortlist for the greatest kids TV show ever! - Tuesday 30th July 2013. The Australian pay television company Foxtel has announced in the following press release, from their official website, foxtel.com.au, that the cable and satellite television provider's brand new IPTV (Internet Protocol television) service called Foxtel Play went live on Tuesday 30th July 2013, ahead of its official launch on Sunday 11th August 2013. The Internet TV service, which is offering even more Australians access to Foxtel's extensive programme library, is being delivered over the internet initially to eligible Samsung Smart TVs, Xbox 360 and PC and Mac computers, enabling customers with a broadband connection to watch programs from Foxtel's amazing range of kids, sports, drama, entertainment, documentary and movie channels, including Nickelodeon Australia, live or on catch-up with no lock-in contract and no installation costs. Foxtel has also announced that its highly acclaimed Foxtel Go service will be available to Foxtel Play subscribers as part of their subscription. Customers can access Foxtel Go on up to two registered devices including iPads and selected iPhones and selected Samsung smartphones and tablets. Foxtel announced that Foxtel Play has gone live today ahead of its official launch on Sunday August 11. Foxtel Play is a new internet TV service, offering even more Australians access to Foxtel’s unbeatable programming. Delivered over the internet initially to eligible Samsung Smart TVs, Xbox 360 and PC and Mac computers, Foxtel Play enables customers with a broadband connection to watch programs from Foxtel’s amazing range of sports, drama, entertainment, documentary and movie channels live or on catch-up with no lock-in contract and no installation costs. Foxtel Play offers customers access to content as soon as they sign up and enables them to subscribe by the month and pay as they go, with prices starting at $25 per month. With no lock-in contract, subscribers can stop and start their subscription month-to-month, to suit their circumstances or viewing choices. A new flexible package structure will allow customers to choose from four basic genre-based packages priced at $25 for one, $35 for two, $45 for three and $50 for four. Sport and Premium Drama and Movies can be purchased for a further $25 each. This means that a sports or movies enthusiast can now get Foxtel’s comprehensive offering in one of those genres plus a range of additional channels of their choosing in one basic genre-based package for $50 per month or less than $12 per week. Foxtel Play packages will feature over 40 live channels including Fox Sports 1, 2 and 3, Foxtel Movie channels, Showcase, FOX8, Arena, Lifestyle, History, Discovery, A&E, National Geographic, UKTV, FX, SoHo, MTV, Universal Channel, ESPN, Cartoon Network, Nickelodeon and Disney Channel and hundreds of catch up video on-demand titles. Foxtel also announced that its highly acclaimed Foxtel Go service will be available to Foxtel Play subscribers as part of their subscription. Customers can access Foxtel Go on up to two registered devices including iPads and selected iPhones and selected Samsung smartphones and tablets. Foxtel Play will be offered with a 7 day free trial for new subscribers and is available with no commitment, no installation and no upfront costs. Foxtel Play is available today on eligible Samsung Smart TVs, Xbox 360 and PC/ Mac computers and is coming soon to eligible LG smart TVs. Foxtel Play is available over Ethernet and WiFi internet connections for Xbox 360 and eligible Samsung Smart TVs while Foxtel Go is available over 3G/4G networks and WiFi for tablets and smartphones. See full list of compatible devices here: www.foxtel.com.au/foxtelplay/howitworks. Not all channels/content are available on all devices with Foxtel Play and Foxtel Go. Recommended Internet speeds apply. Internet connection with minimum speed of at least 3Mbps required to view Foxtel Play and Foxtel Go. ISP and data charges may apply. Video quality may vary according to connection type. Only available for use in Australia. Foxtel Go available on compatible smartphones and tablet devices running an eligible operating system. You must subscribe to the relevant channel/tier in your Foxtel Play pack to access corresponding content on Foxtel Go. Not all channels available on Foxtel Go. Foxtel and some services not available to all homes. Xbox LIVE Gold subscription required for use on Xbox 360 (charges apply). Free first 7 days of Live TV and Catch Up offering for new Australian residential users. Additional charges apply for Foxtel pay-per view titles. Credit card details are required at time of sign up for any ongoing direct debit subscription payments if you do not cancel your subscription during the first 7 days. A refundable $10 pre-authorisation fee is required upon registration. Ongoing subscription fees reflective of your package apply unless you cancel your subscription. Offer ends 31 October 2013. Full terms and conditions available at: www.foxtelplay.com.au. Apple, iPad and iPhone are trademarks of Apple Inc., registered in the U.S. and other countries. Follow NickALive! on Twitter, Tumblr, Google+, RSS and/or Facebook for the latest Nickelodeon Australia and New Zealand News! Viacom Inc. (NASDAQ: VIAB, VIA), the parent company of the Nickelodeon brand, has announced today (Wednesday 31st July 2013) in the following press release, from PRNewswire, the promotion of Karim Mawji to the newly created position of Senior Vice President (SVP) of Digital Platform for its Music & Entertainment Ad Sales group. Most recently, Karim served as Vice President (VP) of Digital Ad Sales for the Nickelodeon Group. Based in Los Angeles, Mawji will report directly to Jeff Lucas, Head of Sales for Music and Entertainment at Viacom. NEW YORK, July 31, 2013 /PRNewswire-FirstCall/ -- Viacom Inc. (NASDAQ: VIAB, VIA) today announced the promotion of Karim Mawji to the newly created position of Senior Vice President of Digital Platform for its Music & Entertainment Ad Sales group. Most recently, he served as Vice President of Digital Ad Sales for the Nickelodeon Group. Based in Los Angeles, Mawji will report directly to Jeff Lucas, Head of Sales for Music and Entertainment at Viacom. 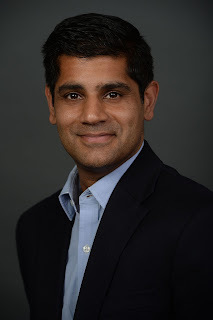 In his new role, Mawji will provide the critical strategic connection between Viacom's Music and Entertainment Ad Sales group and the digital portfolio it supports, which includes the web, app, mobile and social properties of CMT, COMEDY CENTRAL, MTV, MTV2, mtvU, SPIKE, TV Land, VH1, VH1 Classic and Palladia. Mawji will work closely with digital leadership to drive sales strategy that aligns with digital product and editorial initiatives at each brand. Viacom's U.S. web portfolio attracted 72.4 million unique visitors in May* and the company's brands are among the most social in entertainment. "The power of Viacom's portfolio increasingly extends further and further beyond the TV screen, across the our rich interactive experiences on the web, mobile and apps, and our millions of fans and followers on social," said Lucas. "Karim will run point on ensuring that our client solutions draw on our digital scale, product development, and targeting capabilities to make strong connections with consumers." Mawji will foster collaboration among Ad Sales, Integrated Marketing, Digital – as well as specialized units including Viacom's Digital Fusion ad product R&D team and its Data Management Platform – to leverage the company's digital capabilities and scale for clients. He'll also work to develop and leverage the company's strategic sales alliances with Twitter, zeebox and other partners. Mawji is a Viacom veteran with extensive experience in sales and digital media. Most recently, he served as Vice President of Digital Ad Sales for Viacom's Nickelodeon Group, where he oversaw Studio, Gaming and other West Coast client relationships. He joined Nickelodeon in 2001 as an Account Executive. Mawji has also held business development roles at Phase2Media and NetZero, as well as sales positions at Turner Broadcasting and ESPN. Follow NickALive! on Twitter, Tumblr, Google+, RSS and/or Facebook for the latest Viacom News! The PR Company Big Machine Agency has announced in the following press release, from PRNewswire, some of the exciting plans Nickelodeon Star Kendall Schmidt, the lead singer of Nick's hit boy band Big Time Rush, America's most well-known boy band, has for the future! The news release mentions that Kendall's focus will be moving more into music, which could confirm the Nick News that Nickelodeon's hit original musical television series "Big Time Rush" has come to an end. The news release does mention Kendall is planning to focus a limited amount of television specials and movies, which could be a hint that Nickelodeon and Big Time Rush are planning to make a brand new "Big Time Rush" movie/television special in the future! Kendall recently hinted in a interview with the teen-entertainment magazine Popstar! that although the series has wrapped, there may be more BTR movies/TV specials in the pipeline! Big Machine Agency has also announced the news that although "Big Time Rush" the TV series has come to an end, Kendall Schmidt is planning to continue touring with "Big Time Rush"! BMA also mentions in the press release that, when Kendall visits Down Under to perform with Big Time Rush and Heffron Drive, which consists of Big Time Rusher Kendall Schmidt and Big Time Rush's current guitarist, Dustin Belt, at Nickelodeon Australia's Slimefest 2013, Kendall is planning to spend quite a bit of time there and hit hard the studios of both Australia and New Zealand. 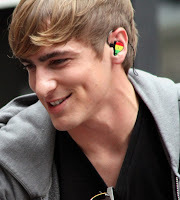 NEW YORK, July 31, 2013 /PRNewswire/ -- As lead singer of Big Time Rush, America's most well-known boy band via Nickelodeon's hit television series plus his active role in Heffron Drive, Kendall Schmidt is one busy guy. Though he will spend the summer continuing the Big Time Rush world tour, fall brings even more activity and plenty of world travel for the teen heartthrob. With his focus moving into music and a limited amount of television specials and movies, Kendall will have more free time to continue touring with both bands as well as log some serious studio time, which is so important to the longtime songwriter that, at any given time, he has over 50 unreleased songs to his name. Long a believer in constant interaction with fans, Kendall will keep up the dizzying pace of press tours, personal appearances and meet and greets, both here at home and abroad. In fact, come September, Kendall will be performing with both bands at Nickelodeon Australia's Slimefest, always a fan favorite. Kendall plans to spend quite a while Down Under and hit hard the studios of both Australia and New Zealand, a place he came to know and love while penning a song with Logan Henderson for New Zealand's biggest pop group Titanium whose debut #1 single "come on home" achieved double platinum status. Heffron Drive, actually founded by Kendall prior to his joining Big Time Rush, was born of a chance meeting. After chatting at an industry event one night in Los Angeles in 2008, Kendall and Dustin Belt realized there was a lot more in common than meets the eye – both had been born in Wichita, Kansas, and when they went to make their way home, they realized they lived on the same street – Heffron Drive. Aside from becoming instant friends, the duo formed a band – what to call it was obvious – and thousands began streaming uploaded tunes via MySpace. The internet was soon buzzing about this new band, but shortly thereafter the Big Time Rush opportunity came along. Kendall joined up and eventually, Dustin was tapped as the touring guitarist for the group. The two never forgot about Heffron Drive, though, stealing spare moments to write and plan. Big Time Rush's force, however, was undeniable. Now in its fourth season, Big Time Rush averaged just under 4 million viewers per episode. The series, which boasts the highest-rated and most-watched Nickelodeon live action premier among kids, tweens and total viewers at a whopping 6.8 million, is as much of an overseas sensation as it is here at home. Big Time Rush is seen in 78 territories and in 17 languages via Nickelodeon channels and syndication. Equally impressive, Big Time Rush has sold 4.33 million singles and more than 1.35 million albums to date. The band also holds the record for fastest sell-out time at Radio City Music Hall – ten minutes! Follow NickALive! on Twitter, Tumblr, Google+, RSS, and/or Facebook for the latest news on your favourite Nickelodeon Stars and Big Time Rush! Nickelodeon, one of the world's leading entertainment brands for kids and families, has announced, in the following press release from TVbytheNumbers, Nick USA's ratings highlights for July 2013! Nickelodeon USA's July 2013 performance marked the networks sixth straight month of gains for 2013, with the channel posting double-digit, year-over-year (+19%) growth with K2-11 (3.0/982,000). Nick's gains were fueled by solid performances from the hit Nickelodeon original animated series (Nicktoon) "SpongeBob SquarePants, which ranks as the top animated series for the month with K2-11 (4.8/1.6M) and its hit preschool lineup, which netted Nickelodeon the top spot with preschoolers for July (3.2/428K; +42%). Nickelodeon Preschool Animations popular original CGI-animated series "Bubble Guppies" ranks as Nick's top preschool series for the month, averaging a 5.0/673K with K2-5. In addition to its monthly gains, Nickelodeon's preschool programming block is posting double-digit year to date increases, up +12% with K2-5. Additionally, Nickelodeon USA's nighttime programming block, Nick at Nite (stylized as nick@nite) closed the month as the number-one cable network with W18-49 and posted double-digit gains with A18-49 (+63%) and W18-49 (+61%) over last year. Nick USA's full ratings report, including Nick's ratings for "Sam & Cat", "The Haunted Hathaways" and "Sanjay and Craig", can be found in the following press release. NEW YORK – July 30, 2013 – Nickelodeon's July performance marked the net’s sixth straight month of gains for 2013, with the channel posting double-digit, year-over-year (+19%) growth with K2-11 (3.0/982,000). Nick’s gains were fueled by solid performances from SpongeBob SquarePants, which ranks as the top animated series for the month with K2-11 (4.8/1.6M) and its hit preschool lineup, which netted Nickelodeon the top spot with preschoolers for July (3.2/428K; +42%). Bubble Guppies ranks as Nick’s top preschool series for the month, averaging a 5.0/673K with K2-5. In addition to its monthly gains, Nickelodeon’s preschool block is posting double-digit year to date increases, up +12% with K2-5. The live-action series The Haunted Hathaways, which is averaging 2.8M total viewers and a 4.6/1.5M K2-11, 5.4/1.1M K6-11 and 4.2/842K T9-14 since launch (Saturday, July 13, 8:30 p.m. ET/PT). The series lodged triple-digit gains over last year with kids and posted a spirited 3.3 million total viewers for its primetime premiere. Sam & Cat, which currently averages 3.2 million total viewers and posts double-digit year over year gains for the net with K2-11 (+32%) and K6-11 (+21%). Sam & Cat nabbed 4.2 million total viewers with its June 8, which also marked the net’s biggest live-action launch in three years. Sanjay and Craig, which currently ranks as the top new animated series with boys 2-11 for 2013, is averaging 3 million total viewers per episode and posting year over year gains with K2-11 (+13%) and K6-11 (+23%). The animated hit tallied 3.6 million total viewers for its Saturday, May 25, premiere, driving double-digit gains with kids 2-11 and kids 6-11 and ranking as the number-two kids’ program on all TV for the week (behind only SpongeBob SquarePants). Additionally, Nick at Nite closed the month as the number-one cable net with W18-49 and posted double-digit gains with A18-49 (+63%) and W18-49 (+61%) over last year. Kidscreen's children's digital entertainment and media news website iKids is reporting the exciting Nickelodeon USA News in the following article that, with sales of HTML5-compatible phones expected to exceed one billion this year (2013), Nickelodeon has launched a brand new HTML5 mobile gaming hub that will house 15 free games designed to be played on iOS (iPhone, iPad, iPod) and Android devices! 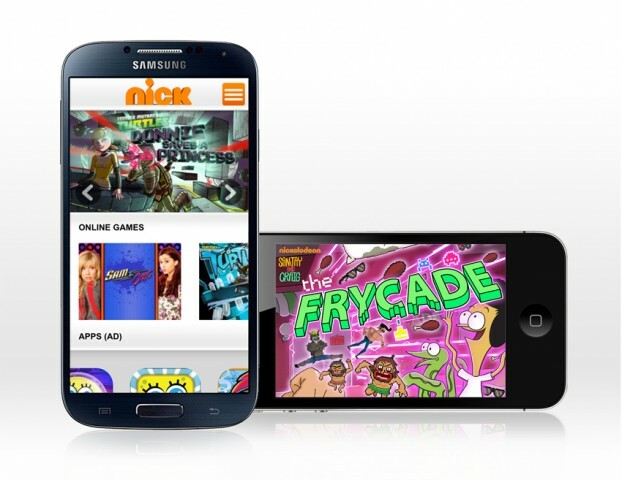 The online games, now accessible to Nickheads located in the USA at m.nick.com/games, feature gamed based on popular Nickelodeon brands such as "SpongeBob SquarePants" and "Teenage Mutant Ninja Turtles". The site will be updated regularly and will be optimized for tablets later this year. Although free, users will need an internet connection to access the mobile-friendly site. Nickelodeon is now among the few kids networks to develop games in HTML5, which reduces the need for external plugins such as Flash and is accessible in web browsers of devices such as the iPhone 4S. With sales of HTML5-compatible phones expected to exceed one billion this year, Nickelodeon has launched a new HTML5 mobile gaming hub that will house 15 free games for iOS and Android devices. The games, now accessible at m.nick.com/games, feature evergreen brands like SpongeBob SquarePants and Teenage Mutant Ninja Turtles. The site will be updated regularly and will be optimized for tablets later this year. Users will need an internet connection to access the mobile-friendly site. Nickledeon is now among the few kids networks to develop games in HTML5, which reduces the need for external plugins such as Flash and is accessible in web browsers of devices such as the iPhone 4S. The kidnet has made a significant mobile push this year, having launched its on-demand Nick App for the iPad in February. 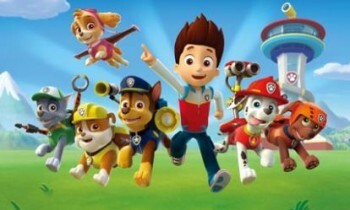 The entertainment industry news website C21Media is reporting the Nickelodeon International news that two Canadian broadcasters have picked up the broadcast rights to Nickelodeon's "Paw Patrol", a brand new CG-animated preschool series based on a concept by "Bob the Builder" creator Keith Chapman! Following the world premiere of "Paw Patrol" on Nick USA on Monday 12th August 2013 at 8:30 p.m. (ET/PT), TVOKids, a daily children's programming block on TVOntario (TVO), Ontario's provincial educational television network, and British Columbia's Knowledge Network, a Canadian English language public educational cable television network in the province of British Columbia, will start to show episodes of "Paw Patrol" from Monday 2nd September 2013. The series will also begin airing on Nickelodeon's international channels from Autumn/Fall 2013. It is currently unknown whether Nickelodeon Canada and/or YTV will also start to air "Paw Patrol". Two Canadian broadcasters have picked up Nickelodeon’s forthcoming toon Paw Patrol, based on a concept by Bob the Builder creator Keith Chapman. TVO Kids and Knowledge Network will begin airing the preschool toon on September 2. Paw Patrol is the first solely owned property from Canadian toyco Spin Master’s prodco Spin Master Entertainment. The CGI animated toon has been coproduced with Guru Studio (Justin Time) and Nickelodeon. The series, which follows a group of heroic puppies led by a tech-savvy 10-year-old, will debut on Nickelodeon in the US next month before airing on Nick’s international channels in the fall. The series focuses on citizenship, social skills and problem-solving, Nick said. The creation of Paw Patrol follows the demise of Chapman Entertainment, the prodco Chapman co-founded in 2002 and went into administration last year. Nickelodeon has licensed the global (excluding Canada) distribution rights to Paw Patrol on behalf of Viacom International from Spin Master, as well as all ancillary exploitation rights, including licensing and merchandising. A Profile Of "SpongeBob SquareShorts: Original Fan Tributes" Finalist Nicole van Schoor From South Africa, Creator Of The SBSP Short Film "Finally Home"
The South African arts, culture and entertainment news website Artslink.co.za has posted a profile of and a interview they had with young Uitenhage resident, Nicole van Schoor, whose short "SpongeBob SquarePants" film, titled "Finally Home", is a finalist in Nickelodeon's first-ever global "SpongeBob SquarePants"-themed short film competition, "SpongeBob SquareShorts: Original Fan Tributes", which you can read below! Nicole's "SpongeBob" short film is about a dedicated Spongebob Fan and her quest in finding her ultimate dream home. You can watch an online streaming video clip of and vote for Nicole's entry here on Nick's official "SpongeBob SquareShorts: Original Fan Tributes" website, spongebobsquareshorts.com. You can also vote for "Finally Home" on Twitter by using the dedicated hashtag #SquareShortsVOTE2! Kevin Meiring and Nicole van Schoor are the creative talents behind Nicole reaching the finals of the international video contest. More than 1,000 SpongeBob inspired short films–celebrating the positivity and optimism of the Nickelodeon megastar were submitted by fans and filmmakers of all ages from all corners of the world during the submission period, which ran from May 6 to June 28. Entries were received in animation, stop-motion, and live-action, among others. Featuring original storylines, the top five finalist videos in both categories highlight SpongeBob's endearing attributes: humor, overflowing happiness and persistent positivity. Finalists were chosen by a panel of judges comprised of Nickelodeon executives from all corners of the globe. Videos were judged on originality & creativity, incorporation of SpongeBob's attributes, and overall appeal. Now through Friday, August 2, at 8:00p.m. EDT, fans can visit www.spongebobsquareshorts.com to watch the finalist videos and vote for their favorites in each category via the website and/or via Twitter. To cast a vote via Twitter, tweet the unique hashtag associated with each of the short films. A winner from each category will be announced by August 9th and awarded a $2,500 cash prize and a trip for four people to a screening event at the recently announced "SpongeBob Fan Shellabration" at Universal Studios in Hollywood, Calif.
Bob on the Box: Help Nicole to win! Here's a column kickoff with a difference: a young Uitenhage resident, Nicole van Schoor, is in line for an international video prize. Recently, the kids entertainment service, Nickelodeon (DStv Channel 305,) ran an international contest related to the popular animated series, Spongebob Squarepants. During the dedicated entry period (May 8 to June 28 this year), died-in-the-wool fans of the endearing character were asked to create an original short live action film, titled Spongebob Squareshorts: Original Fan Tributes, celebrating Bob's attributes: humour, overflowing happiness and persistent positivity and optimism. More than 1100 entries were received from countries all over the world where the series is telecast and 21-year-old Nicole's entry was selected as one of the five finalists in the "18 years and over" category. This is an amazing achievement when it is considered that the other four finalists in her section of the competition (there is an under 18 years category as well) came from residents of Mexico, Germany and two from the United States. The storyline in her short movie follows a dedicated SpongeBob Fan (Nicole herself!) 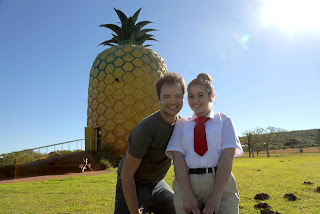 in her quest to find her ultimate dream home, ending up at the giant Pineapple near Bathurst in the Eastern Cape. Finalists were chosen by a panel of judges comprised of Nickelodeon executives from all corners of the globe. Videos were judged on originality and creativity, incorporation of SpongeBob’s attributes, and overall appeal. Fans can visit www.spongebobsquareshorts.com until this Saturday, August 3, up to 2am South African time to watch the finalist videos and vote for their favourites in each category via the website and/or via Twitter. To cast a vote via Twitter, tweet the unique hashtag associated with each of the short films (Nicole's is #SquareShortsVOTE2. A winner from each category will be announced by August 9 and awarded a $2,500 cash prize and a trip for four people to a screening event at the recently announced SpongeBob Fan Shellabration at Universal Studios in Hollywood, California. So go to it fans - help Nicole to win that much-prized trip by casting your vote for the Eastern Cape participant. And now what can I tell you about her? Well, in her own words: "I am indeed 21 years old and the other person in the photograph with me is film-maker extraordinaire Kevin Meiring (age 27). There were only the two of of us making up the entire production (filming, acting, etc)! By profession Kevin and I are both graphic designers at Hype Advertising, but we also often work in film production and photography. We viewed the advert about the competition on TV while watching an episode of Spongebob (being in the creative industry, we both truly are huge fans of the show and animation/ cartoons in general!) and knew it would be a great opportunity for us to enter. Kevin has worked on other advertisements and video production before and has acted in a few videos, but the Spongebob Squareshorts entry was my acting debut into the industry (Ha! Ha!.......). It was truly exciting and fun working on the film (both of us being from Port Elizabeth, we had to drive extensively to get to Bathurst to reach the Big Pineapple, for the end of the film) so it was a lot of effort and a long drive for what worked out as only seconds of footage, but the story would not have had the same impact otherwise". And reaching the final five internationally was, obviously, a huge bonus! Follow NickALive! on Twitter, Tumblr, Google+, via RSS, and/or Facebook for the latest Nickelodeon and SpongeBob SquareShorts news! The local British newspaper Your Local Guardian has announced in the following article from the Richmond area of their official website, yourlocalguardian.co.uk, the exciting news that Nickelodeon UK presenter Anna Williamson ("Camp Orange", "Jamie's & Anna's Big Weekend", "UPick Summer", "N-View") will be a presenter at Bounce Festival 2013, a new family festival which will take place at Old Deer Park, in Twickenham Road, Richmond over Saturday 10th and Sunday 11th August 2013, which promises a weekend of summer holiday activities, entertainment and fun for families and children aged up to 12! 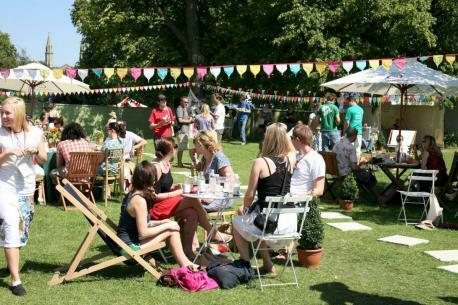 At Bounce Festival 2013, visitors can experience a world of endless entertainment, exciting activities and unexpected fun at every turn! Anna will be joined by daredevil science presenter Greg Foot, and will host The Big Stage, and five activity zones which will include everything from science experiments to street dance - No Limits (action and adventure, featuring Bounce Assault Course and Bike It), Daredevil Science (science, featuring KABOOM! and Everest Lab), Create & Craft (arts, featuring The Big Bounce Masterpiece, Dancing People (Keith Haring), Leaf Sculpture (Kandinsky), and String Print and Rubbing (Van Gogh)), Dig It! (with Creepy Creatures, the Baa-rmy Sheep Show, and the Urban Nursery), and What's Cooking (featuring Scrumptious Surprises!, The Big Bounce Bake Off, and Smoothie Bikes). Musical performers will play throughout the weekend, including the stars and cast of the popular Nick Jr. Channel UK and Ireland preschool show "The Go!Go!Go! Show"! Daredevil science presenter Greg Foot and children’s television presenter Anna Williamson will host an imaginative new family festival. Bounce Festival promises a weekend of summer holiday activities, entertainment and fun for families and children aged up to 12. 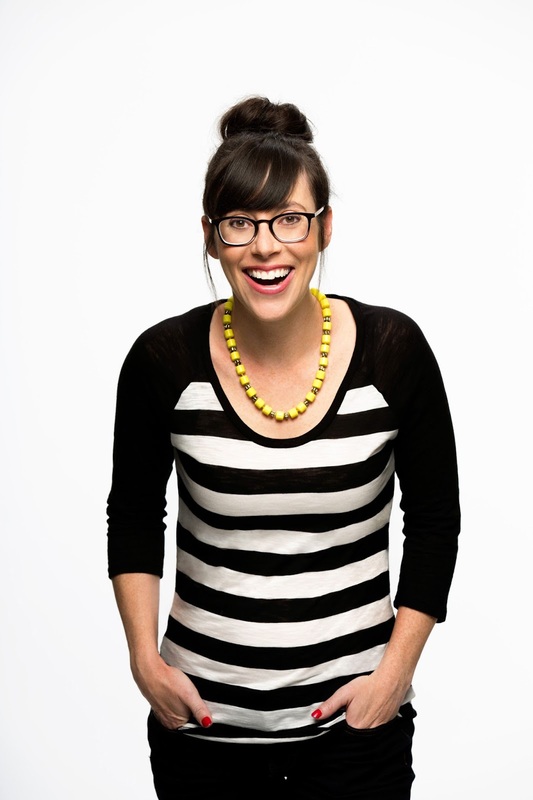 Williamson, who is known for her work with Nickelodeon, CITV, This Morning and Daybreak, will host the main stage and five activity zones including everything from science experiments to street dance. Famed for his extreme science shows full of experiments and explosions, Foot will present two interactive shows, Kaboom and Everest Lab, in his very own daredevil science zone. Musical performers will play throughout the weekend, including the boys from Da Bluez, a street dance crew from Olivier award-winning Blue Boy Entertainment, Beatboxers the Vocal Orchestra and extreme juggling duo Rosie and Chaz. Creative children can try their hand at different artistic styles to help create the big bounce collaborative artwork or find out where food comes from in the splat cooking show with food broadcaster Beverley Glock. Those with any energy left can tackle the no limits army assault course, try weird and wonderful cycles, test out their rugby skills and have a giggle in the comedy club for children. Bounce Festival at Old Deer Park, in Twickenham Road, Richmond; August 10 and 11; Tickets £18 in advance, £20 on the day, with family passes available. Visit bouncefestival.co.uk. The Bounce Festival Festival created by Sledge. UPDATE (29/7/2013) - Nickelodeon UK's official press release announcing the news can be found below! Nickelodeon UK has announced and confirmed the very exciting Nick UK News in a Tweet (post) on their official Twitter profile page (@NickelodeonUK) that Nickelodeon UK & Ireland and Nickelodeon HD UK will premiere and show the Nickelodeon Fruit Shoot Skills Awards 2013, the awards show which recognises and celebrates talented young people from across the UK with serious skills, on television on Sunday 8th September 2013, the very next day after Nickelodeon and Britvic holds this years Nickelodeon Fruit Shoot Skills Awards event at London's O2 Indigo Arena, situated on the Greenwich peninsula in South East London, England, UK, on Saturday 7th September 2013! The entertainment news website Digital Spy is reporting that Nick UK will be airing the Nickelodeon Fruit Shoot Skills Awards at 5.00pm (repeated from 6:00pm on Nick UK's plus-one timeshift channel, Nick+1)! 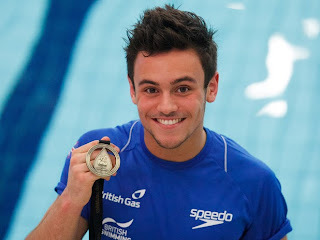 In the same Tweet, Nick UK has also announced the very exciting news that the British diver, London 2012 Summer Olympic Games medalist and Kids' Choice Awards winner Tom Daley ("Splash!") will be the host of Nickelodeon's Fruit Shoot Skills Awards 2013, which promises to be bigger and better, packed with more skills, more awards, and more slime than ever before! Digital Spy is also reporting the exciting news that, from today (Monday 29th July 2013) until Saturday 31st August 2013, visitors to the official Nickelodeon Fruit Shoot Skills Awards 2013 website at nick.co.uk/fruitshootskills can vote for who they think deserves to win a coveted 'Golden Skillie' award. Nominees for the awards have been selected by a panel of experts who have been mega busy over the past three months travelling across the country to find the UK's most skilled children in a range of activities, from Breakdancing and Skateboarding to BMXing and Soccer Freestyling, and Nick has now created 6 cool Skills Award categories featuring 4 nominees in each: Best Baller, Best Biker, Best Boarder, Best Skater, Best Dancer and Best Rider! Scroll down for a full list of nominees! According to DS, tickets to the Nickelodeon Fruit Shoot Skills Awards 2013 ceremony will also become available from the website from Monday 5th August 2013! 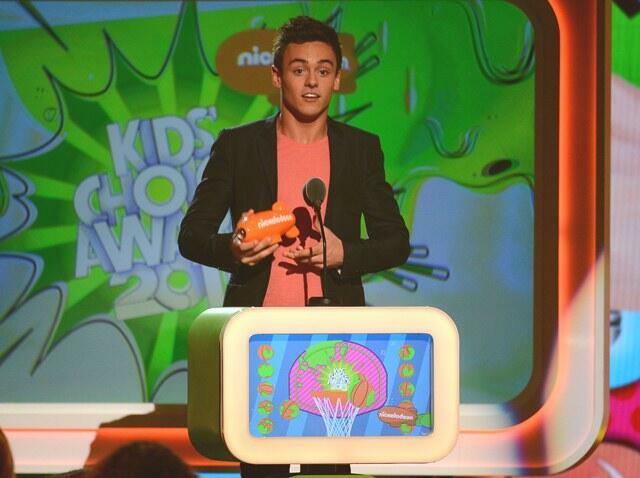 To celebrate Tom Daley presenting the 2013, Nickelodeon Fruit Shoot Skills Awards, Nick UK has unveiled their latest promo/trailer for the awards ceremony, in which Daley can be seen playing basketball, skateboarding and slipping into a football kit to show off his skills, before changing into his trunks and promising "more slime" than in previous ceremonies, which you can watch below! Olivia is representing the girls with all the freestyle football skills to pay the bills! When she isn’t on the pitch running rings around the lads, she is out practicing her freestyle! Olivia is a female soccer star of the future, no doubt. Josh is an up and coming star in football freestyle. Come rain or shine, Josh will be outside training hard and perfecting tricks! Josh has a big following online where he showcases his skills and teaches others the tricks of his trade! Adam is a self-taught freestyler with lightning-fast feet and is always pushing to master the next big trick! His ground work is second to none, and his creative combos really wow the crowds! Theo is our youngest and one of the most talked about freestyler skillsters in the country right now! Theo’s ability to link up and land almighty combos has got heads turning and tongues wagging! Matty has been hitting BMX trials for two years and been making quite a name for himself on the trials circuit. With growing interest from sponsors all over the UK, Matty’s dreams of becoming a pro rider may be closer to a reality! Mark has only been riding for two years and already has a bag of tricks veteran riders would be proud of! From intense tail whips to truck drivers, this guy has serious skills! Fourteen year old Beth has been riding for five years and is already the World No. 2 for girls BMX racing! Beth hits the track hard and the jumps even harder, and one day hopes to make it to the Olympic finals! Kristian lives, sleeps and breathes boarding and it’s clear all the hours of practice are paying off! He has recently been inducted into the broke skateboarding team, as he rides hard and rolls easy! Mikey is a thirteen year old from Liverpool and the youngest member of the skateport team! He practices nearly every night with his younger brother and friends and hits the vert ramps hard and always pushes himself to go big! Katie got her first snowboard when she was five years old and started competing just a year later! She’s won gold medals in both the kids, women’s and senior women’s competitions and is only the fifth girl EVER to land a double backflip! Ayla was born in London and started riding when she was only three years old! She loves to ride all styles of boarding, from pipe, slopestyle, giant slalom and big air! Footage courtesy of Max Thidling, Steve Addicott and Stewart Monk. Nine year old Eddie and six years old Terra are sisters from Wolverhampton whose BGirl talents have taken them all over the world! Whether they are competing at international competitions, appearing in music videos, or even performing on 'The Ellen Degeneres Show' in the USA. Soly is one of the youngest grit scooter pro team riders and has a little over two years behind the handlebars! Soly’s favourite trick to date is the back flip with no hands, and he is fast becoming the ‘one to watch’ on the scoot circuit. Jacques is a pro scooter rider sponsored by Skate Hut and Lucky Scooter Parts UK. He is currently one of the hottest freestyle riders on the UK scoot scene and competes all around Europe! Fourteen year old Maddie has been riding scooters for over a year and lives to Scoot! She hits the parks as much as she can, and has been representing UK girl riders on scoot tours and competitions nationwide! Keenan is a young shredder with some serious scoot skills. As a team rider for SkateHut and Blunt Scooters UK, Keenan makes it count when it’s competition time and is bringing the noise every ride! Jordan has been skating for eleven years, and when he lets rip on the ramps it’s clear to see he is a master in the making! Becoming a team rider for ‘That Rolling Brand’ – it’s clear to see Jordan has a future on wheels! Tony is one of the most talked about British Bladers on the scene – and his creativity carving around the park makes him stand out from the crowd! He has been skating harder every day and is destined for the Pro Leagues! Keanan is an up and coming skater from London, and making a name for himself on the competition circuit. Whether he is rolling the street course, or working the jump box, Keanan is a fearless, fast and fierce flow rider! Cei is a little blader with big promise, and letting him loose in the park proves Cei has got what it takes to hit the big time! Cei is the youngest ‘Skater’ nominee, but his supreme grinds and big air grabs showcase that Cei means business! Who wins is up to you! Vote for who YOU think deserves to win a Nickelodeon Fruit Shoot Skills Awards here at http://fruitshoot.nick.co.uk/upload-your-skills-video/vote/! London – 29th July 2013 – Olympic diver Tom Daley will host Nickelodeon's Fruit Shoot Skills Awards 2013 live from London's IndigO2 on Saturday 7th September. The event will honour kids from across the UK with seriously impressive skills such as street dancing, skateboarding, BMXing and a host of active skills in-between. The awards ceremony will then be shown on Sunday 8th September at 5pm on Nickelodeon. Following on from last year's awards, this year the celebration will be even better with kids being honoured in seven skills-based categories. The individual accolades will be presented by some of the biggest names in sport, film and television, alongside live music performances. "As a sportsman who has trained hard from an early age, I know just how much dedication and passion it takes to really perfect a skill," said host Tom Daley. "Nickelodeon’s Fruit Shoot Skills Awards recognises the most talented kids in the UK today and who knows, we may even find a new young Olympic hopeful for Team GB!" Winners for all of the awards can be voted for online at nick.co.uk/fruitshootskills from today until 31st August. * Please note each ticket to Nickelodeon's Fruit Shoot Skills Awards 2013 will incur a £1 admin/ booking fee. Available in 14 million homes, Nickelodeon is the place where kids rule and features top shows such as Nickelodeon's Kids' Choice Awards, Victorious, SpongeBob SquarePants and iCarly. Launched in 1993, Nickelodeon brings hit international and locally-produced entertainment content to audiences in the UK and Ireland. Viewers can also watch Nickelodeon in high definition through Nickelodeon HD and have the opportunity to catch up with the schedule through Nickelodeon +1. Exclusive games, behind the scenes clips, show information and more are available on nick.co.uk Nickelodeon is on Sky 604, Virgin 712, TalkTalk channel 315 and through BT Vision. Robinsons Fruit Shoot was launched by Britvic in 2000 and is now the number one kid's drinks brand as voted for by kids. With a wide range to choose from, there really is something for every kid and every occasion, from the refreshing low sugar range and the flavoured water Hydro, to the juicy My 5 which contains 75% juice and 25% spring water and counts as one of your five a day. Free from artificial colours and flavours, Fruit Shoot features a convenient re-sealable sports cap, for easy-drinking and no spills. The Robinsons Fruit Shoot range reflects current consumer preference, which sees the majority of mums purchasing the low sugar options, accounting for 85% of the total Robinsons Fruit Shoot Juice Drink sales. Olympian will host an awards ceremony from the O2 Arena, Digital Spy can reveal. Tom Daley has landed his first TV presenting role fronting Nickelodeon's Fruit Shoot Skills Awards, Digital Spy can reveal. The Olympic medal-winning diver, who previously served as a mentor on ITV's Splash!, will host the ceremony honouring talented children across the UK from London's O2 Indigo Arena on Saturday, September 7. "As a sportsman who has trained hard from an early age, I know just how much dedication and passion it takes to really perfect a skill," Daley said. "Nickelodeon's Fruit Shoot Skills Awards recognises the most talented kids in the UK today and who knows, we may even find a new young Olympic hopeful for Team GB." In a promo for the awards, Daley can be seen playing basketball, skateboarding and slipping into a football kit to show off his skills, before changing into his trunks and promising "more slime" than in previous ceremonies. Lawson and Amelia Lily are among the musical acts to have played at the Skills Awards previously, with performers for this year's ceremony still to be announced. Nominees for the awards were selected by a panel of experts who travelled across the country to find the UK's most skilled children. Winners for all of the awards can be voted for online at nick.co.uk/fruitshootskills from today (July 29) until August 31. Tickets to the ceremony are also available from the website from August 5. Watch Nickelodeon's Fruit Shoot Skills Awards 2013 on Sunday, September 8 at 5pm on Nickelodeon. The Nickelodeon UK fanblog NickUKHub is reporting the exciting Nick UK News, that, to celebrate the 2013 British and Irish school summer holidays, Nickelodeon UK & Ireland and Nickelodeon HD UK will be showing back-to-back episodes of a fantastic selection of popular Nickelodeon shows every weekday and weekend throughout the summer holidays, as part of "Summer on Nickelodeon UK 2013"! To further celebrate the summer school holidays, Nick UK will be showing weekend marathons of hit shows every weekend from 10:00am and 4:00pm (replayed between 11:00pm to 5:00pm on Nick+), with a different show showcased each day, as part of a brand new programming block called "Nickelodeon's Summer Weekends". The block features its own on-air design package, including bumpers. Nickelodeon UK's weekend marathons line-up will be. On Sunday 18th August 2013, Nick UK will be dedicating the block to a great selection of popular movies and specials. Sunday 18th August 2013 - Back-to-back movies and specials. Join the conversation on Twitter - #SummerOnNick! Follow NickALive! on Twitter, Tumblr, Google+, and/or Facebook for the latest Nickelodeon UK and #SummerOnNick News! The British national daily newspaper The Guardian is reporting the Nickelodeon News in their official website's online television guide that the UK terrestrial television broadcaster Channel 5 and Channel 5 HD will start to premiere and show Saban's "Power Rangers Megaforce", the 20th and latest series in the long-running "Power Rangers" franchise, on Saturday 3rd August 2013 at 10:15am (repeated at 11:15am on Ch.5's plus-one (+1) timeshift channel, Channel 5 +1). Bandai UK recently released the first wave of PRM merchandise from Bandai's brand new "Power Rangers Megaforce" toyline, which is available to buy in shops around the UK now. 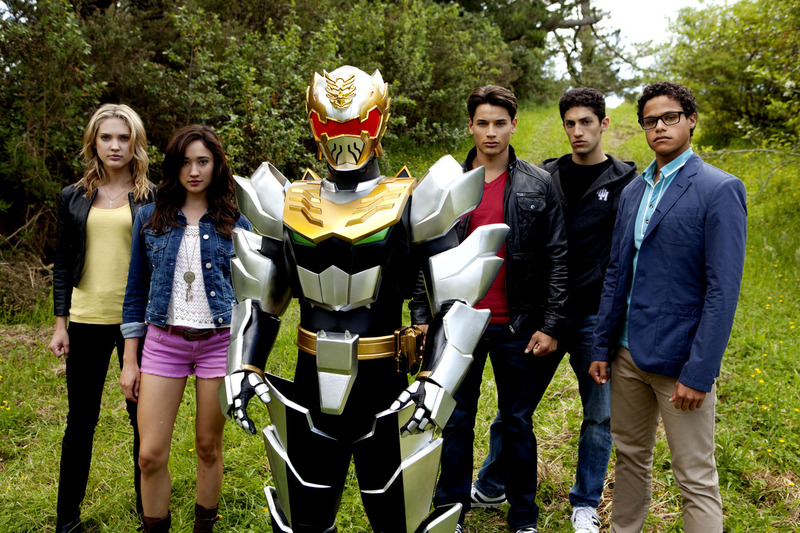 It is currently unknown when or if Nickelodeon UK and Ireland is also planning to air "Power Rangers Megaforce". In the latest series of "Power Rangers", "Power Rangers Megaforce", when the evil Warstar aliens attack Earth, the supernatural guardian Gosei, assigned to protect the Earth by Zordon, and his faithful robot assistant Tensou recruit five teenagers with attitude to combat the invading forces. Equipped with powers that grant them mastery over martial arts and other forms of combat, the teenagers transform into the latest champions of good: The Power Rangers Megaforce. This season introduces new cast members Ciara Hanna as Gia, the Yellow Ranger; Christina Masterson as Emma, the Pink Ranger; Andrew Gray as Troy, the Red Ranger; John Mark Loudermilk as Noah, the Blue Ranger; and Azim Rizk as the new Black Ranger, with Chris Auer providing the voice of Robo Knight. Thanks to Twitter user @wizardboy1011 for alerting me to the news! Follow NickALive! on Twitter, Tumblr, Google+, and/or Facebook for the latest Nickelodeon UK and "Power Rangers" News! Nick Jr. USA's NickMom Announces New Development Slate Including Whoopi Goldberg Project And Greenlights Second Season Of Docu-Comedy "Take Me To Your Mother"
Nickelodeon, one of the world's leading recognized entertainment brands for kids and families, has announced in the following press release, from PRNewswire, that NickMom, the nighttime (10 p.m. – 2 a.m. ET/PT) comedy block just for moms on Nickelodeon USA's Nick Jr. channel, announced several new programming initiatives during its presentation at the TCA Summer Press Tour 2013 in Beverly Hills this morning (Friday 26th July 2013). 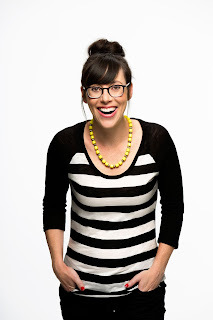 NickMom Senior Vice President (SVP), Bronwen O'Keefe, announced the pick-up of a second season of the docu-comedy series, "Take Me To Your Mother", starring comic Andrea Rosen, and development deals for four new series with Whoopi Goldberg among the producers. "Take Me To Your Mother", which follows new mom Rosen as she seeks parenting advice from moms around the country, will commence production on season two this fall. The NickMom shows in development include "Lounge" (working title), "Country Mom, City Mom" (working title), "Undercover Cupid" (working title), and a Untitled Vinnie Brand project. You can find more information about each brand new NickMom series in Nick's press release below. BEVERLY HILLS, Calif., July 26, 2013 /PRNewswire/ -- NickMom, the nighttime (10 p.m. – 2 a.m. ET/PT) comedy block just for moms on Nickelodeon's Nick Jr. channel, announced several new programming initiatives during its presentation at the TCA Summer Press Tour in Beverly Hills this morning. NickMom Senior Vice President, Bronwen O'Keefe, announced the pick-up of a second season of the docu-comedy series, Take Me To Your Mother, starring comic Andrea Rosen, and development deals for four new series with Whoopi Goldberg among the producers. Take Me To Your Mother, which follows new mom Rosen as she seeks parenting advice from moms around the country, will commence production on season two this fall. Lounge (working title) – Executive-produced by Whoopi Goldberg through WHOOP Inc., this talk/variety series features raw, honest and funny conversations between real, everyday moms who are given an opportunity to be pampered, celebrated and have their dreams come true. Country Mom, City Mom (working title) – Executive-produced by Relativity Real (Catfish, American Bible Challenge), this docu-comedy follows funny mom Tanya McQueen (Picker Sisters, Extreme Makeover: Home Edition) who splits her time raising two teen boys in small town Texas and living in Los Angeles with her second husband and his kids. Undercover Cupid (working title) – Executive-produced by Scott Stone (The Man Show, BrainSurge), this hidden-camera show follows single parents whose teen and young adult kids pick eligible dates for them. Untitled Vinnie Brand project – Executive-produced by Entertainment One (eOne), Vinnie Brand and Jim Breuer, this docu-comedy follows comedian and father of five daughters Brand who has a lot of women in his life, and they're all telling him what to do! NickMom is a primetime ad-supported TV block for moms that airs daily from 10 p.m. – 2 a.m. (ET/PT) on the Nick Jr. channel. The block features a mix of original long and short-form programming, including talk shows, stand-up and sketch comedy, scripted comedy, docu-series and more. Current series on NickMom include: Take Me To Your Mother; NickMom Night Out; Parental Discretion With Stefanie Wilder-Taylor, MFF: Mom Friends Forever; The New Adventures of Old Christine and Yes, Dear! NickMom recently picked up 13 episodes of its first original scripted comedy series, Instant Mom, starring Tia Mowry-Hardrict. NickMom is also a fully featured comedy and entertainment site with extensive content including short-form video, photos, editorial pieces and games. Follow NickALive! on Twitter, Tumblr, Google+, and/or Facebook for the latest Nickelodeon and NickMom News! Nickelodeon, one of the world's leading recognized entertainment brands for kids and families, has today (Friday 26th July 2013) announced in the following press release, from PRNewswire, the exciting NickMom News that NickMom, Nick Jr. USA's evening programming block (stylized as nickmom), will start to premiere and show "Instant Mom", its first original scripted comedy series, starring and produced by Tia Mowry-Hardrict ("Tia & Tamera", Nick UK's "Sister Sister"), this Fall (Autumn) 2013! The half-hour, multi-camera series features Mowry-Hardrict as Stephanie, a party girl who trades in Cosmos for carpools when she marries Charlie (Michael Boatman, "Spin City", "Anger Management"), who already has three kids. NickMom has picked the sitcom up for 13 episodes and will premiere in Nick Jr. Channel USA's primetime NickMom block, with encore episodes airing on Nickelodeon USA's nighttime programming block, Nick at Nite (stylized as nick@nite). In "Instant Mom", Stephanie (Mowry-Hardrict) slowly grows into her role as a full-time stepmom while struggling to maintain some sense of her fun-loving, slightly irresponsible life. Sheryl Lee Ralph ("Moesha") stars as Stephanie's mother Maggie, and rounding out the cast are Charlie's three kids played by Sydney Park ("CSI: NY"), Tylen Williams and Damarr Calhoun. BEVERLY HILLS, Calif., July 26, 2013 /PRNewswire/ -- NickMom this fall will premiere Instant Mom, its first original scripted comedy series, starring and produced by Tia Mowry-Hardrict (Tia & Tamera). The half-hour, multi-camera series features Mowry-Hardrict as Stephanie, a party girl who trades in Cosmos for carpools when she marries Charlie (Michael Boatman, Spin City), who already has three kids. The series is picked up for 13 episodes and will premiere in the primetime NickMom block on the Nick Jr. channel, with encore episodes airing on Nick at Nite. "First-generation Nickelodeon viewers are now moms and will soon be treated to NickMom's first original comedy with someone they grew up watching and loving," said Bronwen O'Keefe, Senior Vice President, NickMom. "We're excited our audience will get to see Tia in her first starring role as a mom, joined by the very talented Michael Boatman and Sheryl Lee Ralph." In Instant Mom, Stephanie (Mowry-Hardrict) slowly grows into her role as a full-time stepmom while struggling to maintain some sense of her fun-loving, slightly irresponsible life. Sheryl Lee Ralph (Moesha) stars as Stephanie's mother Maggie, and rounding out the cast are Charlie's three kids played by Sydney Park (CSI: NY), Tylen Williams and Damarr Calhoun. Sophisticated, savvy and an all-around sweetheart, actress Tia Mowry-Hardrict has been in the public eye for over 17 years, gaining initial fame starring opposite her twin sister Tamera Mowry-Housley in the hit comedy Sister Sister from Paramount Television. On Sister Sister's successful six-year run, Tia won two NAACP Image Awards and three Kids' Choice Awards for Favorite Television Actress. After graduating from Pepperdine University, she made appearances in various projects, including starring with her sister once again in The Disney Channel's original movie Twitches in 2005 and again in Twitches Too, two years later. In 2006, Tia landed the role of "Melanie Barnett," medical student turned wife of pro-football player on The Game, which landed her two more NAACP Image Award nominations. Currently, Tia is starring in with her sister Tamera and executive producing the STYLE network series Tia & Tamera, which set a record as the most watched series launch in the network's history. Season three returns summer 2013. Tia recently released her debut book Oh Baby! : Pregnancy Tales and Advice from One Hot Mama to Another, and filmed and released a fitness DVD. With her sister, she developed and launched their first product line entitled need and their first product called MILKY! hit Destination Maternity stores nationwide this spring. Tia is also set to appear in the upcoming Fox Searchlight Pictures film Baggage Claim, to be released in September. 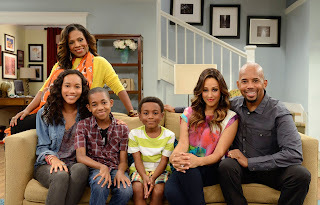 Instant Mom is executive-produced by Howard Gould and Aaron Kaplan. Gould had served as executive producer and head writer of Cybill when it won the Golden Globe for Best Comedy Series. He also wrote and directed the feature film The Six Wives of Henry Lefay, starring Tim Allen, Elisha Cuthbert, Andie MacDowell and Jenna Elfman. Gould's other credits include FM, Home Improvement, The Jeff Foxworthy Show, Mr. 3000 and Shrek the Third. Aaron Kaplan is the Founder and CEO of Kapital Entertainment, a self-funded, truly independent production company. Since its formation in 2009, Kapital Entertainment has become a prominent leader in the media industry, known for its vast array of television, digital, and film content. In just over four years, Kaplan has executive produced over 150 episodes of television and has had ten television projects ordered to series including The Neighbors on ABC, Wendell & Vinnie on Nickelodeon, Chasing Life on ABC Family, Back in the Game on ABC and Friends with Better Lives on CBS. He also executive produced Fox's Terra Nova with Steven Spielberg and Peter Chernin. Since its formation, Kapital has had 21 pilots ordered. NickMom is a new primetime ad-supported TV block for moms that airs on the Nick Jr. channel. The block features a mix of original long and short-form programming including talk shows, stand-up and sketch comedy, docu-series and more. Current series on NickMom include: NickMom Night Out; Take Me To Your Mother; MFF: Mom Friends Forever; Parental Discretion With Stefanie Wilder-Taylor and The New Adventures of Old Christine. NickMom recently picked up second seasons of the stand-up comedy series, NickMom Night Out, hosted by Sherri Shepherd (The View) and talk show hybrid Parental Discretion with Stefanie Wilder-Taylor. NickMom is also a comedy and entertainment site with extensive content including short-form video, photos, editorial pieces and games. The comic book news website Comic Book Resources and the entertainment news website Digital Spy are reporting the exciting Nickelodeon News that the American comic book writer, artist and former magician Roman Dirge, best known as the creator of the "Lenore, The Cute Little Dead Girl" black comedy comic book series, announced during his spotlight panel at San Diego Comic-Con 2013 that he is currently developing a brand new "gender-bending" fantasy animated comedy series called "Princess Battle Boy" for Nickelodeon, that, produced by Starburns and based on a concept by Steve Green, is a "fish out of water story about this Viking kid [a boy] who becomes Princess Sparkle Time in the Sparkle forest"! Prior to working on "Princess Battle Boy", Roman Dirge is also best known for his contributions to fellow Slave Labor, a independent American comic book publisher, creator Jhonen Vasquez's cult original Nickelodeon animated show (Nicktoon) "Invader Zim". Roman Dirge is also currently recovering from a traffic accident which took place in February 2013 accident in which he and his girlfriend were struck by an SUV as they crossed a street. The British regional newspaper the Bexley Times has announced in the following article that Nick Jr. megastar "Dora the Explorer" will be bringing her live musical stage show, "Dora The Explorer LIVE! Search For The City Of Lost Toys", to the Churchill Theatre in Bromley, South East London, England, UK, where Nickelodeon's preschool superstar will be holding six performances of her live musical stage show - on Monday 12th August 2013 at 4:00pm, Tuesday 13th August 2013 at 10:00am, 1:00pm and 4:00pm, and Wednesday 14th August 2013 at 10:00am and 1:00pm - as part of the entertainment complex's Summer season of entertainment! 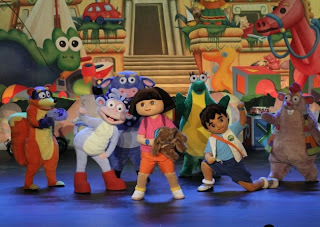 Tickets for Dora the Explorer LIVE! at Bromley's Churchill Theatre are priced between £18.90 - £20.90 and are available to buy by visiting www.atgtickets.com/miltonkeynes (all bookings made through ATG Tickets for this venue are subject to a £2.85 Transaction fee). Dora the Explorer will be searching for her lost teddy bear in Bromley next month. Dora The Explorer is on the hunt for her lost teddy bear at The Churchill Theatre next month. The multi-lingual Nickelodeon character comes to The Churchill Theatre, in Bromley High Street, for a show that features regular characters Map, Backpack, Boots and Diego. Dora will need some help from the audience as she tries to find the City of Lost Toys in order to retrieve her beloved teddy, Osito. She will use her map-reading, counting, musical and language skills to navigate her way through the number pyramid and mixed-up jungle to reach the city. But youngsters better watch out for the sneaky fox, Swiper, who is out to make Dora’s journey a little more difficult. Dora the Explorer Live! will see fans able to dance and sing along with the characters across six shows from Monday, August 12 to Wednesday, August 14. Tickets cost £18.90, visit atgtickets.com/bromley.